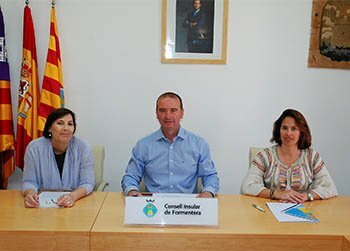 This morning the Formentera Council and the Espai Dones association renewed a pact by which the local administration will provide €3,000 in funding to support the organisation of dynamic and educational activities that work toward equality promotion and the prevention of domestic violence. At the signing were Council president Jaume Ferrer, social welfare councillor Dolores Fernández Tamargo and Espai Dones president Vanessa Díaz. All three affirmed their satisfaction with the results of collaboration between the Council and Espai Dones to this day – to wit, yearly pledges of funding that had until this year been set at €2,500. The last week of March was the final hurrah for activities celebrating Women's History Month. Coordination of the March Women's History Month programme calendar, as well as the activities that accompany International Day for the Elimination of Violence against Women (25 November) constitute the bulk of Espai Dones programming. 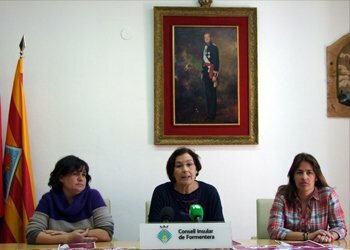 The Institut Balear de la Dona, a local association established to fight for the rights and interests of women, together with the Formentera Island Council have this morning lent their signatures to an important joint accord. Acting as representatives of their respective institutions were Dolores Fernández Tamargo, councilor of Social Welfare, Youth Services and Equality of the Formentera Council, and Isabel Llinàs, director of the Institut Balear. The collaborative accord set out several different goals: preventing domestic violence; attending to the victims of such abuse; promoting equality and maintaining an actively-operating point of information, accessible to all women on the island. By virtue of today's accord, the Institut commits to providing the Formentera Council with 9,000€ in economic support, one thousand euros more than any of the four previous years. In addition to its financial support, the Institut commits to providing training as required by the island's social care professionals. Under the terms of the agreement, the Council, for its part, commits to providing the human and material resources necessary to managing abuse prevention and treatment programmes and to administering assistance to victims of such violence. Over time the month of March has come to be recognised by the women of Formentera as a month of celebration, bringing with it as it does International Working Women's Day, 8 March. The women of Formentera come out strong in their yearly recognition of this important date, a moment dedicated to mass mobilisation and the struggle to end the discrimination that translates into an unequal access to resources still today. Once again, the Espai Dones Association, with the collaboration of Formentera's offices of Equality and Culture, has prepared activities for the entire month of March. Starting on the 3rd and extending all the way through the 23rd, this year's activities are reflective in nature. The month-long activities programme runs the gamut; from a photo exhibition by Isa Sanz and storytelling by Encarna de las Heras, to a reading of the manifesto representing the day's founding ideals and – an extremely important event for the aged community of Formentera – the sixth annual homage to elderly women, a celebration of the history of women in Formentera. Opening the programme schedule, on 8 March, a reading of the day's manifesto is organised for the Plaça de la Constitució. Also on this date: Un hilito, a theatrical presentation by Inés Sarmiento that combines theatre, dance and audiovisual productions. The remaining cultural acts, all of which place the woman at the forefront, vary from a projection of the film Cider House Rules; a conference on 11 March entitled “Eva al desnudo: parlem sobre l'autoestima” (All about Eve: Talking about self-esteem) and “En busca de la felicitat: per on començam?” (In pursuit of happiness: where do we start? ), the latter scheduled to close out the programme of activities on 24 March. Both conferences will be led by the psychologist Anna Costa and will be held at the Plenary Hall of the Formentera Island Council. The list of events would of course not be complete without storytelling by Encarna de las Heras (15 March) or, that same evening, the traditional sisterhood supper for all those women – Espai Dones members or otherwise – who wish to participate. The events programme was made possible by the Espai Dones Association, which devotes efforts year after year to the celebration of the International Working Women's Day and the International Day against Domestic Violence. These dates mark relevant moments in women's fight for effective equality and empowerment. Mainly, the celebrations organised around 8 March represent an important push for the defence and awareness of women's rights. Espai Dones Formentera is a not-for-profit women's association. It was founded 5 March 2007 by a group of women who had for many years organised events for 8 March, International Working Women's Day. The association's purpose is to promote gender equality and provide women with counsel, as well as organise workshops and events that are both educational and fun. It is a space to meet, dialogue, foster an environment of social well-being and collaborate with other local associations on the official commemoration of important moments in the struggle for equality. Given the high-quality and nobility of the association's work, since last year an accord has officially linked Espai Dones with the Formentera Council, facilitating and formalising a relationship that had steadily evolved since the inception of the Council. Both entities are extremely active on issues of awareness and reflection, but also, from a legal standpoint, both recognise the important role of pressing charges in cases of abuse and discrimination, continuously moving forward in actively involving our society on this issue. The Office of Equality believes support of gender-based initiatives to be vitally important, especially considering the oppressive atmosphere of cutbacks that has taken its toll on equality policies and, as an extension, increased risks for women and their children. The Office of Social Welfare oversees the management of two fundamental services for the women of Formentera, the first being immediate support for victims of domestic violence and the second – complementary and of unqualified importance – equal-rights training and domestic violence prevention. The support service for domestic abuse victims comprises immediate attention, mentoring and on-going support for the victims during periods of vulnerability. This service uses tools like the emergency telephone line (24 hours/day) and relies on a close coordination with the Guardia Civil. The service also includes home-visits when an immediate separation of the victim and aggressor is necessary. This is overseen in collaboration with the Eivissa Women's Office. Additionally, a therapeutic psychologist service is provided in cases of necessity, as is a service offering legal counsel. We believe that equal-rights training is a very important factor in domestic violence prevention. For this reason the Office of Equality works closely with the Office of Culture in the realisation of communicative actions to generate social change and promote advancements in gender equality. We believe that every woman must attain a certain level of empowerment in order to defend herself and prevent domestic violence from taking place, especially on an island as pluralistic and diverse as ours. With time the month of March has come to be recognised for its celebration of the women of Formentera, dovetailing with the International Working Women's Day, 8 March. The women of Formentera come out strong in their celebration of this important day, the one moment dedicated every year to social mobilisation and ending the discrimination that continues to effect an unequal access to resources. Once again, the Espai Dones Association, with the collaboration of Formentera's Office of Equality, has prepared activities for the entire month of March. These activities have taken a reflective turn. From a photo exhibition reinforcing feminine expression to traditional storytelling, which, this latter, for the second year running and due to the great success received by the first edition, will also be directed at younger residents. Additional activities will include the V homage to adult women – extremely important to the adult population – which celebrates the history of the woman in Formentera. The remaining cultural acts, all of which place the woman at the forefront, vary from informational talks to a theatrical production and a make-up workshop, without forgetting the traditional sisterhood supper. New to the panorama this year is the 8 March events schedule, the product of a contest organised by Espai Dones aimed at increasing the participation of younger residents. The winner was Júlia Tur Mayans. The events programme was made possible by the Espai Dones Association, which devotes efforts year after year to the celebration of the International Working Women's Day and the International Day against Domestic Violence. These days mark relevant moments in women's fight for effective equality and empowerment. Mainly, the celebration organised around this day represents an important thrust of momentum for the defence and awareness of women's rights. Espai Dones Formentera is a not-for-profit women's association. It was founded 5 March 2007 by a group of women who for many years had organised events for 8 March, International Working Women's Day. The association's purpose is to promote gender equality and provide women with counsel, as well as organise workshops and educational and recreational events. It is a space for encounters, dialogue, development of social well-being, fun and collaboration with local entities for the official commemoration of days significant to the struggle for equality. The association works actively with the Spanish Association against Cancer in its numerous campaigns, takes part in Formentera's Intercultural Day, an event organised by the Office of Social Welfare, and also participates in the sale of second-hand books for the Day of Sant Jordi. Today, the president of the Formentera Island Council, Jaume Ferrer, together with Maria Antònia Ferragut, the president of the association Espai Dones, signed a collaborative accord between the two entities. The accord will serve to strengthen and formalise the close collaboration that has come to exist between the two entities on the issue of equality. As part of the accord the Council will grant 2,500€ for actions promoting equality and working toward domestic violence prevention. Likewise, Espai Dones commits to programming awareness-raising activities and actions around women's rights and domestic abuse issues. To reach this objective, educational activities and talks are held on subjects of equality and increasing sensibility toward the rights of the woman. The association was created in 2007 to implicate native Formentera women in the struggle for equality. The Formentera Council's Office of Equality works in close concert with the feminist association, mainly for the events related to the Day of the Woman Worker (8 March) and the International Day against Domestic Violence (25 November), both relevant milestones in the path toward effective equality, but also on women's empowerment issues and violence prevention/rejection. Acts of violence are too present in our societies, and although anyone can be affected, there is nevertheless a greater incidence among women and children. The Council as a collective is of the opinion that training on equality issues is fundamental to reducing domestic abuse. It is on these issues that the Office of Equality works in conjunction with the Office of Culture, programming events that generate change and promote the advancement of gender equality, fomenting a culture of female empowerment. We consider that every woman must attain a certain empowerment in order to defend herself and prevent domestic violence, especially on an island as pluralistic and diverse as ours. The Office of Social Welfare carries out two fundamental services for the women of Formentera, the first being immediate support for victims of domestic violence and the second – complementary and of unqualified importance – equal rights training and domestic violence prevention. The support service for domestic abuse victims comprises immediate attention, mentoring and on-going support for the victims during periods of vulnerability. This service uses tools like the emergency social telephone line (24 hours/day), which relies on a close coordination with the Guardia Civil. The service is also complemented with home-visits when an immediate separation of the victim and her aggressor is necessary. This is realized in collaboration with the Eivissa Women's Office. It is the duty of the Formentera Island Council – as established by article 31 of the regulatory Organic Law 1/2002 (22 March) on the right of association – to promote and facilitate the development of associations that work in the general public interest while still respecting a fundamental liberty and autonomy with respect to public authority. The law also states that these associations be accorded economic aid and assistance in the undertaking of their activity. To this effect, articles 70.20 of Organic Law 2/1983 (25 February) of the Balearic Islands' Statue of Autonomy, later modified by Organic Law 1/2007 (28 February), state that polices that deal with gender and work-family life balance are to be the remit of the different island councils.